Treat yourself and your guests to a decadent tour through a sampler of gourmet brownies. 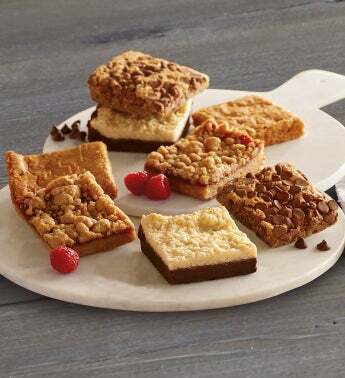 There's an exceptional macaroon brownie variation featuring a creamy coconut layer topping and butterscotch and chocolate chip blondies—resembling traditional chocolate brownies but with a brown sugar base. There are also delectable raspberry crumb bars for a sweet, fruity taste sensation. This gift offers a winning lineup of intensely rich flavors, enticing textures, and twists on tradition.